There were a few big negatives for SunPower Corporation in 2015. 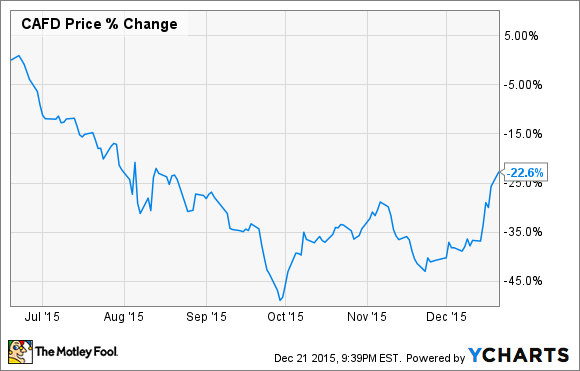 SunPower Corporation (NASDAQ:SPWR) had a great 2015 in many respects. It remained profitable while many competitors were posting massive losses, it expanded its technology lead, and it outlined growth plans that could lead to tripling production by early next decade. But not everything SunPower did in 2015 was positive -- there were a few glaring negatives during the year. The launch of 8point3 Energy Partners (NASDAQ:CAFD) was supposed to be a transformational event for SunPower and co-sponsor First Solar. The yieldco would give them a place to sell projects and also benefit from owning a piece of those projects long-term. But the yieldco market fell apart just as 8point3 Energy Partners was being launched, and the stock is down big since its launch. This creates a long-term problem for SunPower, because the yieldco would like to start selling new shares to the market sometime around mid-2016 to buy more projects from its sponsors. If the stock falls too much, the cost of capital will be too high to offer shares and the opportunity for the yieldco to buy projects dries up. Having a falling yieldco doesn't mean SunPower is in trouble, it just means the company has fewer options for projects short-term. Maybe it will sell more projects than planned to third parties in 2016, or maybe it will fund projects on the balance sheet. No matter what it does, having a falling yieldco wasn't a good headline in 2015. SunPower's growth prediction in fall 2014. Image: SunPower. In 2014, SunPower put big hopes on a product called C7, a concentrating solar system that would leverage industry-leading cell efficiency to deliver low cost electricity. 2015 hasn't seen the company abandon growth goals, just change away from C7 to P-Series, which is a low cost, lower efficiency solar panel. Maybe C7's costs weren't where SunPower needed them, maybe the product didn't perform as expected, or maybe customers just weren't interested. No matter what happened, it was an underappreciated but very significant development. SunPower's growth prediction in fall 2015. Image: SunPower. I say this is a bad headline because it calls into question whether SunPower's management can reasonably predict how technology, costs, and customer adoption will perform in the future. Maybe P-Series is simply a better product than C7, or maybe the company can make more money on regular modules than moving cells to C7, but saying a product will be nearly half of your future demand and then almost abandoning it entirely a year later leaves a bitter taste in my mouth. Earlier this month, SunPower announced the offering of $350 million in convertible debt, a funding source I've questioned in the past and brought up with SunPower's CEO in a conversation earlier this month. When SunPower priced its offering on December 15, it offered $425 million of convertible debt carrying a 4% interest rate and a $30.53 conversion price. You may notice that by just one week later the stock had already traded at nearly the conversion price, making this essentially a dilutive stock offering with the added cost of an interest payment. SunPower's management said that this was basically an offering that reduced the company's funding risk if the yieldco didn't recover or if the ITC wasn't extended and SunPower was foced to finance more projects on its balance sheet. But this is now essentially a stock offering that dilutes current shareholders in an extremely low interest rate environment. I think SunPower has a lot of upside as an investment, but it keeps taking away that upside by issuing convertible debt rather than issuing interest-bearing debt and generating returns above that cost of capital. Management is clearly taking the conservative approach by issuing convertible debt, but it's taking away upside potential if SunPower grows like it says it's going to, which is to the detriment to long-term shareholders.